Posted by Equestrian Tasmania on 23/09/2017. 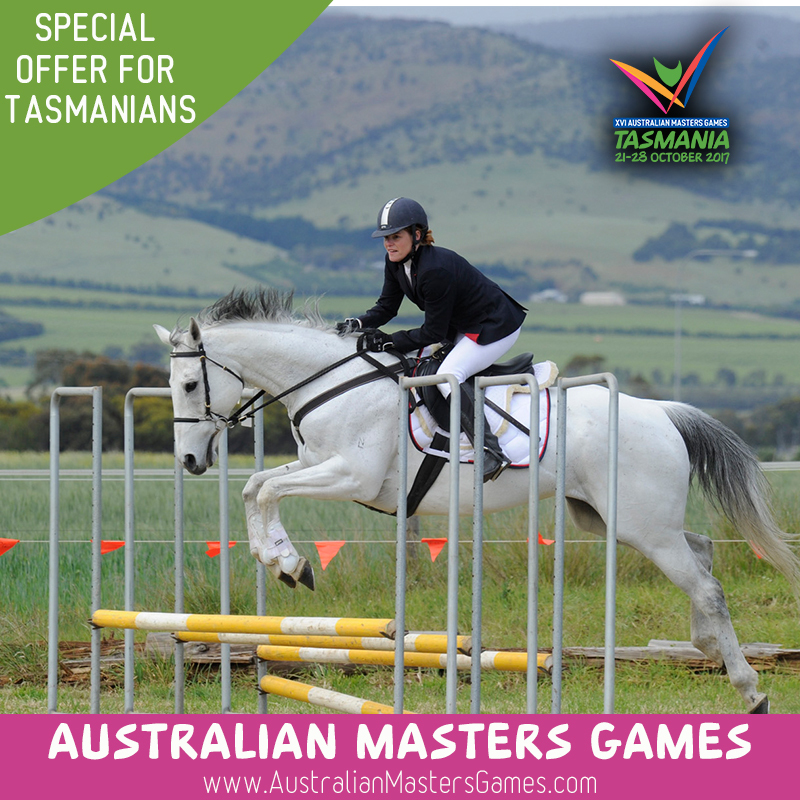 Any locally based Tasmanian who is yet to sign up for the 2017 Australian Masters Games in the state’s North West can do so for another month for a discounted entry fee of $99. On Friday, 11 August the standard entry fee for the 16th edition of the Games, which runs from October 21-28, increased to the standard price of $126.50. Showjumping is one of 40 different sports taking place at the 16th edition of the Australian Masters Games. Over 6,000 participants will compete in this biennial sporting event that is regarded as one of the premier and largest participation sporting events on the Australian sporting landscape. Equestrian (showjumping) will take place from Friday 27 October – Saturday 28 October 2017 at Batten Park, 267 South Road, West Ulverstone, 7315. The event is open to anyone. The only criteria to compete in the Australian Masters Games is that you must meet the minimum age requirement, which in most sports is 30+ years (35+ years for Equestrian). It does not impose qualifying standards and welcomes participants from all over the world. The Australian Masters Games is opening this special $99 entry fee offer for those with a registered address within Tasmania in partnership with the Cradle Coast Authority as a thank you for hosting the Games. “Having the Games here is a big deal not only for the region, but the entire state and it has been great to see everyone getting involved,” General Manager of the Australian Masters Games, Scott Wade said. The Cradle Coast Authority secured the Games with the aim to not only to bring more tourism to the Cradle Coast, but also as something special for the local community. “This is a fantastic excuse to get an old sports team together to replay the ‘79 final or start that goal of exercising more,” Cradle Coast Authority CEO, Brett Smith said. The Games will feature a number of quality sports venues and social offerings across the region, which will begin in Devonport with the Games opening and local food and wine festival and conclude in Burnie with a closing and community after party headlined by the Hoodoo Gurus. Held every two years, the Games are returning to Tasmania for the first time since its inception in 1987 when Hobart attracted 3,695 participants. In 2017 Tasmania’s North West will take the spotlight and aim to host up to 5,000 participants. Final entries for the Australian Masters Games close on Friday, 22 September. Enter now!